When I meet with companies about their biggest marketing challenges—increasing awareness and generating more opportunities are usually high on their list. The lead generation process can be a bit overwhelming, which is why we created a Lead Generation Checklist that outlines the process and required tactics. The checklist makes it easy to get started. Most companies have a good idea of who their target audiences are and what they need, but in today’s hyper-competitive world, companies need deeper insights into how their customers and prospects think in order to give them a competitive edge. A well-thought-out and researched persona will help you craft consistent and compelling marketing messages that will resonate with your target prospects. View a sample persona here. Start creating your own personas by interviewing current customers and prospects. Take these insights and start creating more customer-centric marketing content that will attract and convert more leads. In their classic groundbreaking book on positioning, authors Al Reis and Jack Trout define positioning as A marketing strategy that aims to make a brand occupy a distinct position, relative to competing brands, in the mind of the customer. When thinking about positioning, a great question to ask is “Why should a prospect choose our company over one of our competitors?” Your answers should not include factors that your competitors can claim. Your position should differentiate. If you want to go one step further, develop a Brand Positioning Statement to ensure everyone is on the same page. Personas and Positioning work hand-in-hand to produce customer-centric marketing. When you start with a persona’s needs, issues and challenges, your marketing will resonate resulting in more engagement—including more website visitors and leads. Personas and Positioning are just two of the components in the lead generation process. 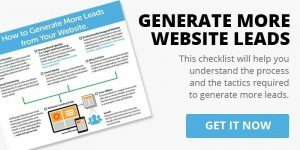 If you’re looking to increase awareness and leads then our Website Lead Generation Checklist will help you. It provides an overview of the lead generation process along with the required marketing tactics. And the checklist format allows you to check off the steps at your own pace. We also recorded a webinar that walks you through the process. You can view it here.